Whether it’s the traditional after shave or cuff links or a high-tech gadget, the gift you select for Dad this year can have the extra dimension of earth awareness. SPIRITS: Many of the best beers come from smaller local and regional breweries. Try one of our picks or email us your Dad’s Favorite! Summertime Beer | Brewed from carbon filtered Lake Michigan water, specialty malts, special ‘house’ yeasts and an extra dose of hops, artisanal Goose Island Beers come in over a dozen styles. A golden ale with a slightly fruity aroma, “Summertime” is ideal for barbecues and picnics. Mothership Wit | Flavored with organically grown wheat malt, coriander and orange peel spicing, Mothership Wit combines New Belgium Brewery’s sustainable practices and its creative brewing inspired by the beers of Belgium. 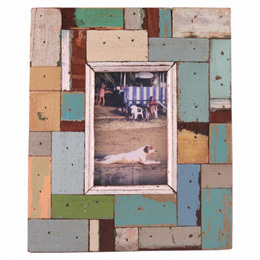 Boat Wood Frame | Handmade from reclaimed boat wood in Buenos Aires, Argentina, these one-of-a-kind frames come in varying colors and textures. 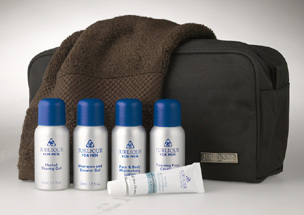 Men's Travel Pack | The Men's Travel Pack includes Shampoo and Shower Gel, Herbal Shaving Gel, Face and Body Moisturizing Lotion, and Blue Face Washer packaged in a convenient Men's Travel Bag. Dell Optiplex Series Computers Dell’s Optiplex series computers are made with components that are lead-free with lower levels of cadmium and brominated flame retardants. 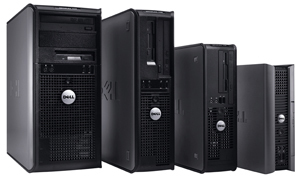 Dell also has one of the most aggressive take-back programs for recycling old electronics.